Octopus. The idea of it is so appealing when you see it on a menu… slow cooked, char grilled, tender and fleshy, new born into a sea of olive oil and garlic and Mediterranean fantasy. You could be sitting in a trattoria in Italy, a taverna in Greece, or a whatever they call a place where you get drunk and eat good food anywhere else. It’s a holiday dish, the kind of food you eat when you’re off somewhere else far from home pretending to be young and adventurous and carefree. “I’ll have the octopus and a carafe of the house white” You say with a confidence born from a sun tan you really don’t deserve. Then long after the memory of the holiday and the tan have faded, you’re back home trying to explain to all your friends just how amazing this octopus dish you had was…So you pick up one up in the local fish monger, and the grim reality of this carnivorous marine mollusk sets in. Octopuses are not pretty creatures. They’re long, wet, slimy, unwieldy things that defy your attempts to nicely put them in a bag, and once you do, more closely resemble the contents of a larger animals stomach, than something you should consider eating. Of course, we are in the fortunate position in 2012 of knowing that millions of people have gone before us to both cook and enjoy this wonderful creature, and the advent of modern fishing has made it’s capture and transportation to our homes much simpler than bygone eras where you had to wrestle with one yourself. Risking life, limb and ink-eye to get your evening meal. So in true “What I did on my holidays” fashion, here is a dish that I came to love while traveling around the north of Colombia. It is of course of a classic Spanish dish from the North West region of Galicia, from which it’s name is derived Pulpo alla Gallega (Galician Octopus). Now there are many areas of conjecture as to which approach to take to cooking the octopus, so I’m not going to go out on a limb and say that my way is the right way, but it worked well for me the few times I’ve made it, so let your conscience be your guide as to how you do yours. Gingerly take your octopus by the top part, which hopefully has the head and beak removed, and is comprised of a ring where all the legs are attached. 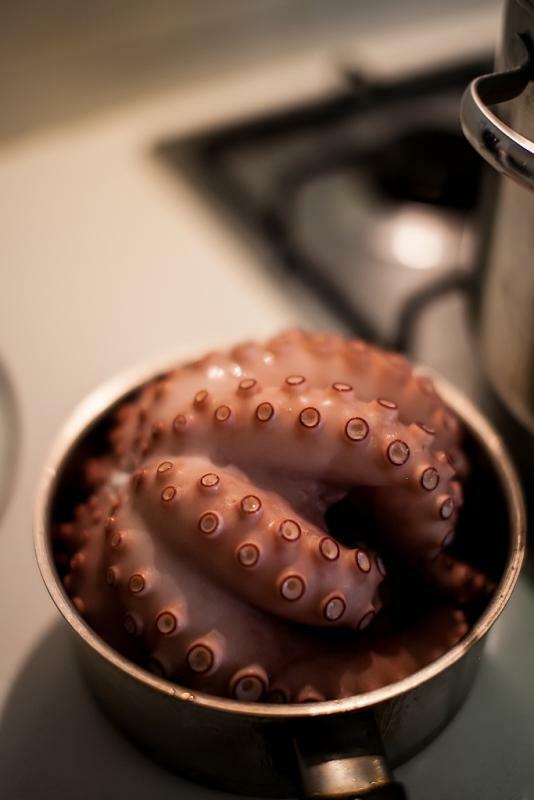 In a large bowl in the sink, wash the octopus well in cold water. Some people say you should freeze the octopus before you start, as that helps to tenderise it, but I haven’t felt the need to do that (it gets perfectly tender when it’s cooked for long enough). Then in the biggest pot you can find (the Spanish say it needs to be a copper pot, but I think you can do just fine without), fill with water and a bay leaf and bring to the boil. 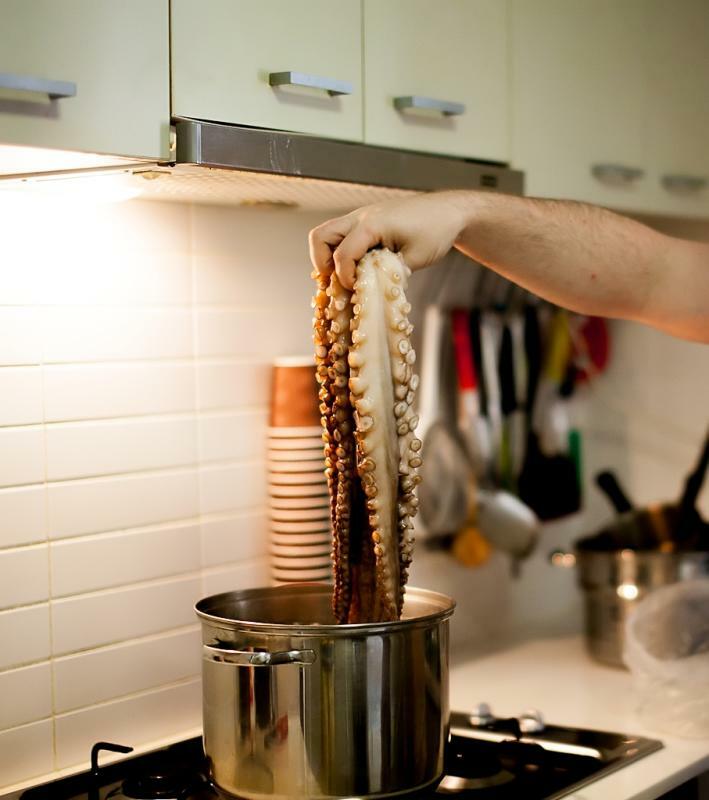 Once the water is boiling carefully dunk the octopus into the water and leave it there for 30 seconds. 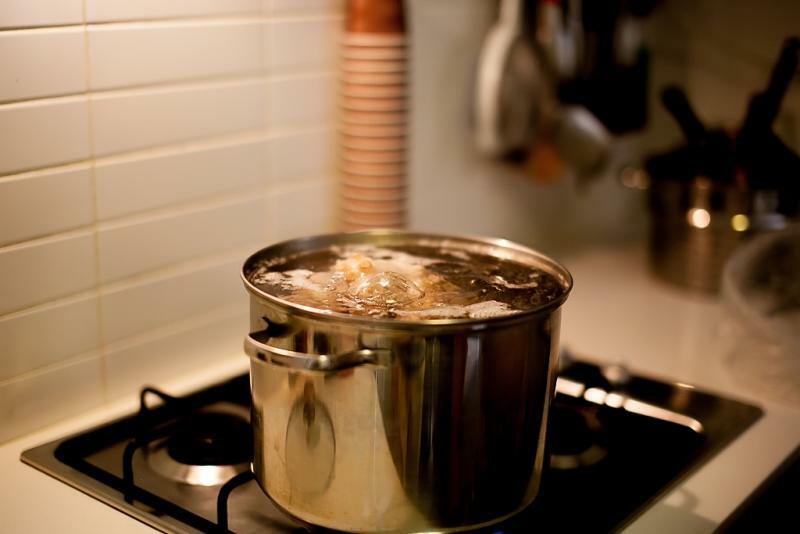 You’ll see the water stops boiling as the cold octopus lowers the temperature, so after 30 seconds, take it back out and let the water come to the boil again. 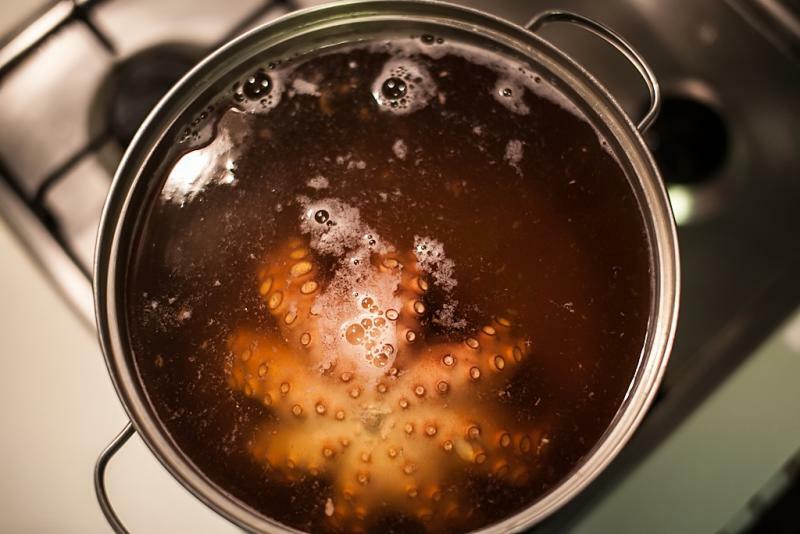 This process of dunking into boiling water is supposed to set the gelatine in the legs and helps to preserve the texture you want. Dunk the octopus back in and out of the water 3 more times and then leave it in there for around 40 minutes on a high simmer until you can pierce it with a knife and it’s soft inside with some resistance outside. 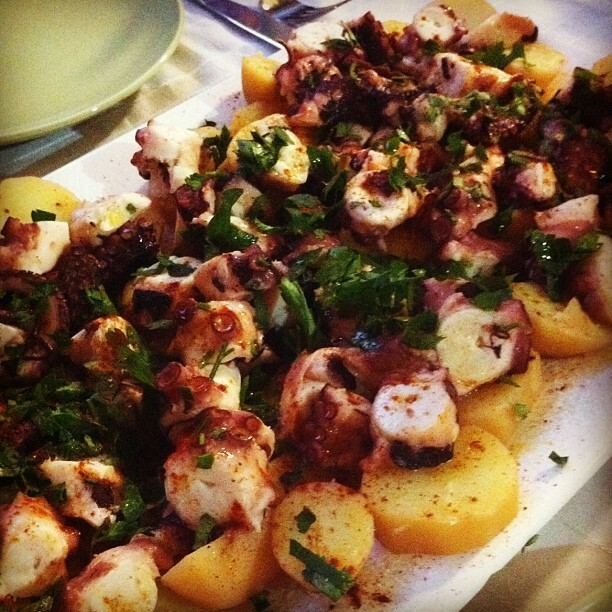 About 20 minutes into the cooking processes, peel the potatoes and drop them into the pot with the octopus whole. They’ll cook along with the octopus and absorb all that briny flavour. They’ll also turn a slightly alarming shade of red, which you shouldn’t be scared by. 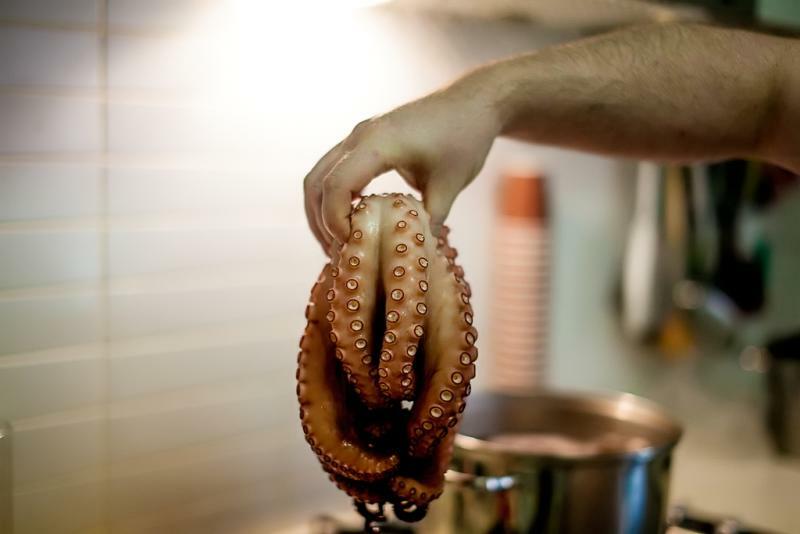 Then when the potatoes and octopus are cooked, take them out and let them cool down on a board, before cutting the octopus into round slices along the leg, and slicing the potato into slightly larger rounds. The arrange the potatoes on a plate or board, season liberally with good sea salt and olive oil, and then add a layer of octopus to the top. Season again with more oil, a healthy sprinkling of paprika, and some finely chopped fresh parsley. Serve it on it’s own, with some crusty bread, or as the first course in a Spanish feast. Make sure you have plenty of crisp white wine, invite a few people who understand what it’s all about, and enjoy the satisfaction that you can bring the best of the world to your door step if you really want to. I saved an octopus recipe from an issue of SPICE a couple of years ago, and liked the sound of it enough to share with an enquiring friend but never actually got around to tackling it myself. You’ve inspired me to as least shuffle through my recipe collection to see if it moved house with me. Carrying an octopus home from Kailis would somewhat count as an arm workout too, I imagine.